that you let us know where you are and how you are using it. It just 'cuz it makes us feel good to know. As always you can show your appreciation by donating to We-Vote , coming up with ideas, and getting as many people registered to vote  and voting as you have time and energy for. 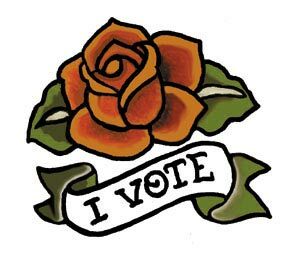 And using this artwork to get folks to the polls. There are are PDF files in CMYK color. Our friends at 100%Portland had temporary tattoos made at TattooSales.com. If you want to use the artwork on file there, please reference #B164596. For 5" versions (good for tees)--white background, black background, clear background (outerglow).